I stand here in front of you as you sit in the swing enjoying the soft breeze of the mid-September afternoon. You are blissfully unaware I'm blocking the blinding rays from your eyes with my shadow. My shoulders are wide enough to eclipse the sun in your lane and allow you to enjoy the last drops of a cool fall day unperturbed by the glaring orange disc behind me. At a year and half, your biggest problem at the moment is retrieving the last dried strawberry from the bag you clutch in your tiny hands. I know how high I can push without frightening you and I keep you moving with the slow, steady consistency of a pendulum easily metered by the repetitious whine of metal on metal which is interrupted only by the drone of traffic. You have no fear of the unknown and therefore no appreciation for the safety I provide. Inconceivable events of earth, wind and fire would have to conspire before I allowed you to fall from the swing; so you sway and you smile with fiery intensity of your own. Your blue eyes gleam like sapphires as you laugh and squeal. I shoulder the weight of your safety as you learn to keep yourself from harm. When we leave the park you'll ride the same shoulders and we'll stroll home enjoying the city's sounds, sights and smells in the twilight of the day and the season. Any mortal in their right mind would be terrified to be hoisted three times their own height atop a giant, but you know nothing of fear. You've never fallen from such a height, as a matter of fact, you've never fallen from any height within my reach. The piece I have trouble with is teaching you actions have consequences without diminishing your intrepid spirit. How do I teach you without scaring you? I want you take on faith that the slide curving away below you is well worth the ride, even though you can't see the end from your vantage point. The moment of uncertainty when you let go is what makes that ride all the sweeter, but too much doubt can hold you back. You are already assembling a respectable collection of bruises on your shins and bumps on your head, but the blades which will cut deepest are years in the distance. I see them coming, as inevitable as the end of this afternoon. No need to mention them, we'll have plenty of time for that. I have faith in the time. Time won't let me down. 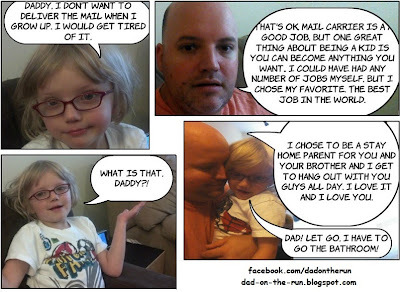 My hope as a father is to remedy all that ails my children. To protect you at all times from all dangers both real and perceived, while teaching you to do the same for yourself along the way. There will be time for that, the shadows will grow much longer before mine fades to black. The truth is, I think I'm doing OK at this dad thing. I had some good teachers; I stand on the shoulders of giants. Perhaps I'm getting too deep into metaphor, even for me, but when it comes to the stories of our fathers sometimes only clichés will do. My Dad is a great father, as was his. I rode on his shoulders when I was your age, I enjoyed their shade when I was swinging, and I cried into them when life seemed unfair. My father taught me how to stand on his shoulders literally, then with his love and support I learned the far more difficult task of standing on those shoulders figuratively. It is not the piggyback rides along Myrtle Beach that come to mind when I think of those shoulders, but the times they carried me through the rough patches in my life. I was blissfully unaware of the diligent protection when I was younger. I had little experience with fear; security was a gift I didn't know I had been given. My father was there when a "big kid" pushed me off a big wheel, he was there to reassure me when I was faced with losing my place as the one and only child, he was there when I struggled with self-esteem in junior high and he taught me not to define myself with the expectations and judgments of others. When I was attacked by a bully on the bus for defending my sister he was there to stand up for me when I was nearly suspended for my unfortunate luck. My father taught me about fairness and courage. His ideas of justice were a constant theme in my childhood, running deep like a vein of iron through a mountain range. My dad was there when I didn't make the grade and when I did, he was there as loved ones left this world, there when I struggled in college and there when I searched for a career. He didn't tell me where to go or what to do, but no matter where I turned his shadow always danced ahead even when he was not physically present. My father was there to remind me that my path was my own and no one would or should prepare it for me, he was there when I fell in and out of love, there when I made bad decisions, there when I succeeded at work, there when I lost a good job, there when I was married to your mother. He's been there following the birth of each of my children; always wanting to show support while not wanting to be in the way, giving me space to live and experience life in my own way. There are times these days when my father's shadow isn't as clear to me and we don't talk as often as we should (a shared fault), but when I look a little closer I can usually see his silhouette against the hard sun of life. His shadow hides the danger and in doing so obscures it's own presence. I know when the day comes and the sun sets on my father, the absence of that cool slither of shade will become shockingly clear... blindingly so. I'll squint at the unforgiving sun. I'll hide my eyes in my hands and I'll weep. Afterwards, I suspect I will spend years realizing the full myriad of ways he protected, supported and encouraged me. I stand on the shoulders of my Dad; as he did on his. As I continue down the path of fatherhood, I enjoy the satisfaction of knowing my shadow will grow longer and provide respite from the cruel elements for those I love the most. I don't say that out of pride for myself, but pride in all of us. It gives me a peaceful, reassuring feeling to know you, my helpless little boy, will one day cast an epic shadow indeed. You will stand against the sun and the wind and the rain; a rock upon which those who love you can make anchor and against those who would harm your loved ones will break themselves. The amazing thing is how much growth you and your sister have precipitated within me as well. That thought makes me happy as I try to conceptualize how my father grew with me. In our family we are sustaining each other and laying the foundation for the future with every laugh and every tear. 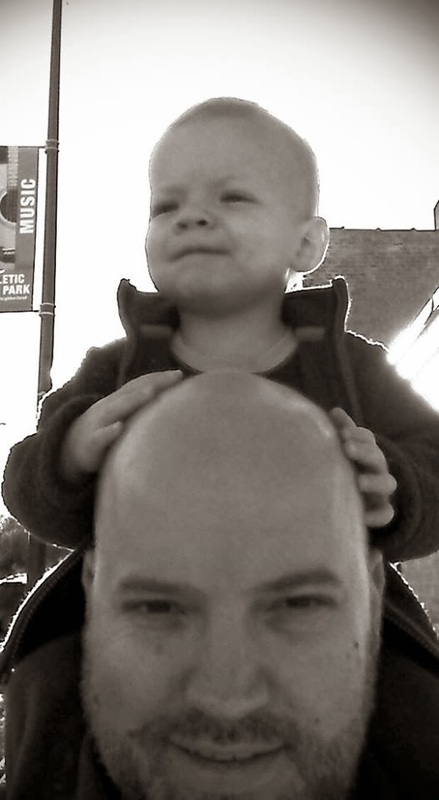 Now our shadows lengthen as we walk home with the sun at our backs and you, my son, on my back. I have to wonder whose shadow stretches ahead of us leading us home. Always, "No huggies, no cleanin' until I get some ice cream"
My honey, my baby, better put those books on a shelf! She said, "don't hand me no lines and put that stuff up yourself"
Cruel baby, baby, why you want to talk back that way? You know, I'm still your Daddy - you still gotta do what I say! Instead she told me a knock knock 'bout spilled milk and a clown? And said, "No huggies, no cleanin' until you gimme a treat now"
My honey, my baby, better put those toys on a shelf! She said, "don't hand me no lines and clean it up yourself"
I said, "Baby, just clean up and we just might!" She said, "No huggies, no cleanin' until you promise tonight!" My honey, my baby, better put your things on that shelf. She said, "No huggies, no cleanin' and put that stuff up yourself." Private investigation was my trade; a few in the industry call it sub Rosa. Silently and unconnected I sat in my car as I did most mornings. It had been steadily cooling for two weeks, but we were still at nearly 80 degrees in South Carolina. The humidity was an uninvited hitchhiker. The reality of the job a far cry from Magnum P.I., watching and recording people through my heavily tinted windows and doing a lot of nothing was a fairly standard Tuesday for me. I was "offline" as the radio wasn't on. Smart-phones were already a thing, but I was years from owning one. "What will be the excitement today?" I wondered. Will the subject of my inquiry check the mail or perhaps go to the grocery store? The adrenaline will course through my veins if that pickup truck leaves the house and my non-descript sedan will pull out discreetly behind him. It is a far cry from the car chases I dreamt of as a child after watching too many episodes of the Dukes of Hazzard, but the jobs we do rarely match the wishes we had for that imaginary future when "I grow up." I always wanted to be a fireman. If I could don that jacket, those boots, that helmet and the shiny badge how exciting my life would be. How much more thrilling my days could be if I lived in a big city and battled the blazes! I didn't know what the hell I was talking about. The reality of a fireman's job is as foreign to me as that of a P.I. is to most of you. The dream doesn't match the reality, the emotions are not what we think and the inner workings of a hero are not so apparent in the movies. The daily weight of leaving one's own family in order to protect others they don't know must be crushing and only tolerable to those with the strongest sense of duty and desire to be there when and where it counts the most. Be it cliché or not, I salute them all. I had not yet met my wife and my children were not even a twinkle in my eye. At 24, I knew little of the world but thought I knew it all. All that changed when my flip phone rang out and I learned that I didn't know much at all. My boss was on the line and asked if I was listening to the radio. I responded I had not been and he, in a tone of disbelief, told me what was going on. I don't have to tell you anything but the date. September 11th, 2001. The heroes of 9/11 weren't fantasizing about the glory they would receive and I'm sure more than a few had no misgivings about their chances of surviving as they ran up unending stairs to a hell of fuel, blood, smoke, cries and fire. I wished with all my heart that all those first responders in NYC were having a boring day. My wishes changed nothing. I rushed home to be with my loved ones and watched in shock as the images of fire, panic and destruction were replayed ad nauseam. I sat, eyes glued to the images for the remainder of the day and spent much more time eyeing the news over the weeks to come than I had before. I reflected on my normal day prior to the news and wondered how many other times I was bored and daydreaming while someone else fought for their life or risked their own to save another. That September day changed so much in the way I think and perceive the world and others. It changed how I look at myself. I conducted a private investigation of my own heart and took stock of my life. I cried for the people suffering, the people dying, their friends and families and I cried for myself and the children I would one day raise and those many of the heroes would not. Sub Rosa in Latin means literally, "under the rose" and I think of it whenever I see a blood red bloom placed upon one of the graves or memorials from that day. I will never forget. A great rendition of a fitting Tom Waits song. 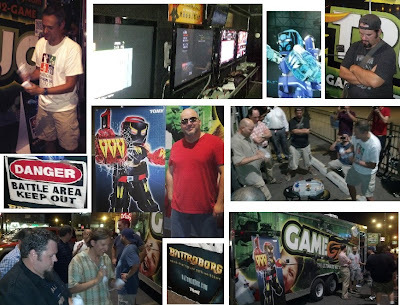 Had a blast night at the #Battroborg #GameTruck event! We battled robots, shot up some zombies, took to the gridiron with a little Madden and had an all around good time. Certainly the most fun I've ever had in a Walgreen's parking lot (not as much fun as I've had in a Walgreens alley, but definitely tops for the parking lot) I was able to meet some new dads and hang out with a few I know already. Great to meet you The Rock Father, Fandads.com,Bobblehead Dad, D.A.D- Dad All Day, DiaryDad's Dadventures, Richard Owen of Chicago Dads Meetup Group, David Cole, Robert Duffer of Men, Marriage and Family GMP, Seth Loeser (winner of best hat of the night and apparently friends with most of the rock and roll legends I idolize). Cameron Smith, Al Wasserberger and of course president Al Watts of The National At-Home Dad Network. Beforehand we went to a place called Hamburger Mary's, the burgers were awesome and the craft beer was excellent. Most of us drank a craft brew called "Marry Hoppins" which was a fitting choice I think for a bunch of involved dads. Special thanks to my buddy, Ariel, who let me hitch a ride to and from the event. Ari heads up the Chicago at Home Dad's Network and will make a tactical SWAT team diaper bag for anyone who wants to storm an enemy position or change a diaper on the go... seriously. Look him up through the Chicago At Home group or message me if you want to get your hands on a diaper bag tough enough for any situation and with more pockets than a Michael Jackson jacket (circa 1982). Occasionally, I read a post that jogs me back to that place where I enjoy writing for writing's sake; writing for myself as an exercise of soul exploration where I revel in the use of words. This time that post was by Bill Peebles of IHopeIWinAToaster. It is most often he or Brian Sorrell of Dadding Full Time who send me waltzing down these introspective forays so far from the clickety, clicky link bait and short funnies I plant more frequently in my word garden blog. Words hold a power, not so much for their meaning (which is secondary as Dylan Thomas will tell you), but for their feel and the excursion they send you on. When reading books I usually find the ride is comfortable, if unpredictable. Some books read like a slow hay ride on a fall day while sipping on warm-spiced cider, others are more like a white-knuckled revolution of a wooden roller coaster but they both have a track and a destination which is known to the author and those who have come before you. There are many voyages to take in a good book and it is hard to surpass the adventure of those worlds, but when it comes to poetry there is no beaten path, there is no comfortable seat, there is not even the reassurance that others have been down this road and found it to be one thing or another. Poetry works differently on each mind. Like a raindrop on a windshield; there is no predicting the path, no way of knowing what other droplets will be collected on the way or if they will evaporate before making it to some unknown destination. In poetry, there is only a void defined by words that might take you to the heavens for a look about or toss you into the abyss of self-reflection without a thought of what errands you were supposed to run today. 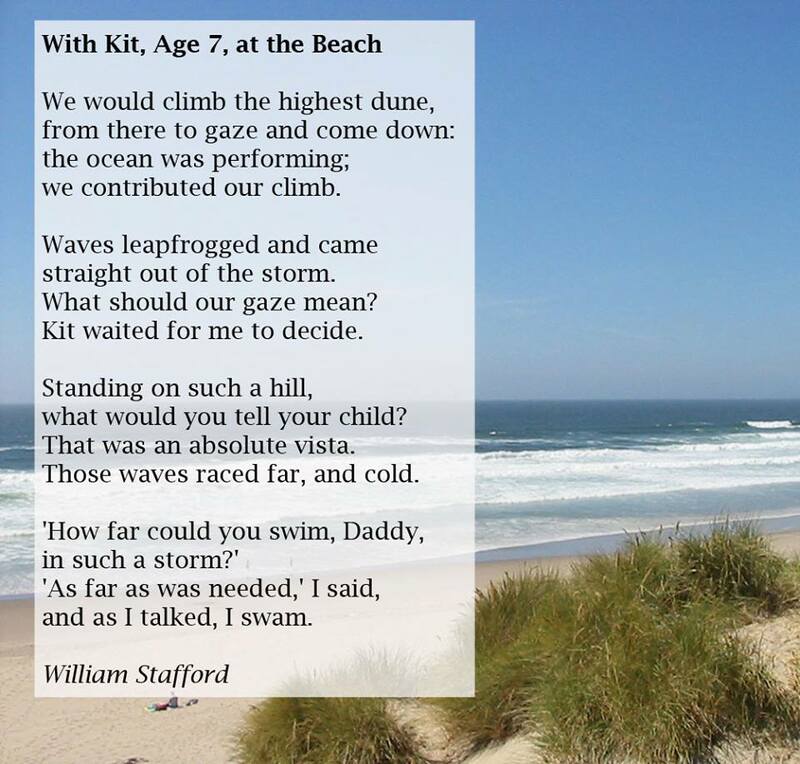 Bill pointed out a feeling I share in his post, that reading poetry can come off as "uppity, fancy or self-indulgent." It is true that reading and reflecting can actually leave me with a feeling of guilt as I think of the day to day grind of my wife and others who punch the clock the day in and day out. I am grateful I have the time to enjoy these pleasures which seem of so little import on the face of it. Poetry brings about close inspection and on it's surface may seem a perfect waste of time, but that thought changes quickly when you find yourself reaching blindly for the last chance of purchase before you cross the threshold into the abyss like "The Race" by Sharon Olds. Time is a blessing. To be able to focus my mind during some of the "down time" on issues of the world, concerns of my soul and the ponderings which have troubled great thinkers for ages is one of the unexpected bonuses of the at-home parent gig. Who knew being a full-time father would lead me down the road of modern day amateur philosopher? I'm thankful to know so many thoughtful parents and, even 4.5 years in, I am still pleasantly surprised to find so many referred to diminutively as "homemakers" who are actually philosophers and warrior poets helping bring insight and the fruits of self-examination to offspring, spouses, friends and themselves. 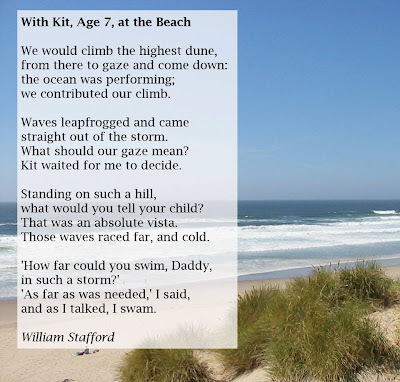 Reading poetry in Bill's article and in preparation for this one left me wondering about the feeling of the word "Daddy" in the minds of my children. I know it has little to do with the meaning I wish upon it and everything to do with my children's perceptions of me. When they are old enough to articulate the feelings that "Daddy" stirs within them, I hope they think of love, comfort, adoration, enthusiasm, interest, gentle guidance and an awareness of my own imperfections. Those are my wishes... like pennies tossed into an abyss, the truth of their final resting will remain a mystery. I want to leave you with two works to think about this week. One is a mystery, as are all great works of poetry; It might make your soul shine or it might make you wonder at the depths of the abyss. The latter is to remind me that my writing is a self-indulgence and that, no matter the philosopher I like imagine myself, that I never take myself too seriously. Both of these poems can be found in The Rag and Bone Shop of the Heart published by Harper Collins in 1992, edited by Robert Bly, James Hillman and Michael Meade and thanks again to Bill for blowing the dust off this collection for me.